Okay, this one’s obvious (or at least it should be!). When photographing landscapes, you’ll want a lot of depth of field, which means a high f-number (usually f/11 or higher), which means longer exposures. And, longer exposures mean more sensitiviy to camera shake. 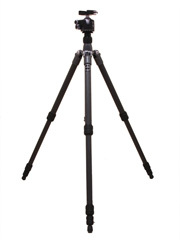 Nothing will keep your camera more still than a tripod. It’s virtually impossible to get sharp landscape photographs without one. In the photo above of a Desert Fan Palm, I used a polarizing filter to deepen the blue color of the desert sky. 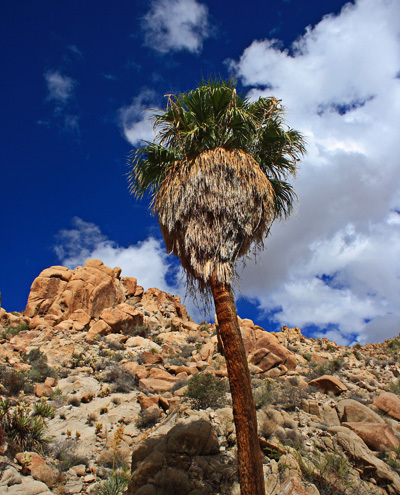 By the way, the Desert Fan Palm happens to be the only species of palm tree that’s really native to California (most of the ones you see in LA and along the coast were actually brought here by the Australians during the gold rush). The polarizing filter helped eliminate the reflections on the rock in the photo above, taken at the Columbia River Gorge in Oregon. Polarizing filters work best when you’re shooting at a 90 degree angle from the sun, so they won’t do much good for you if you’re shooting directly at the sun or if the sun is directly behind you. And, make sure you turn the ring on the filter until you get the best looking results. 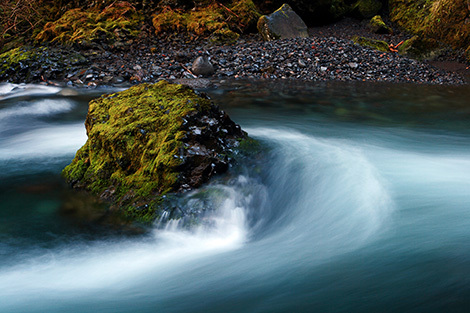 The neutral density filter simply reduces the amount of light coming into your camera, so it’s helpful when you want to get longer shutter speeds. 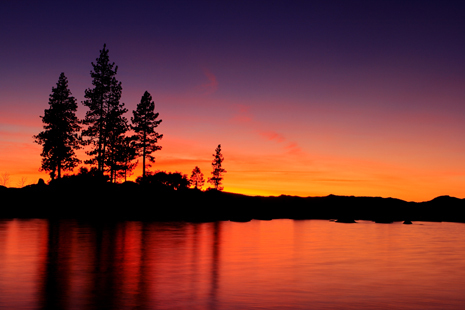 The photo above was taken at Lake Tahoe, Nevada. Since the sun had just set, it was still pretty bright out, but I wanted a photo with smooth water, which required a longer shutter speed. To get this longer shutter speed, I had to reduce the amount of light coming into my camera (the job description of the neutral density filter). Some photographers prefer a 1-stop ND filter, but personally I like the 2-stop because I feel like the 1-stop isn’t strong enough. If I only need to stop down one stop, then I’d rather do something else, like use a smaller aperture. A compass can help you determine where the sun will be at sunrise/sunset, which will tell you if that wonderful golden light will be shining on that ridge or that mountain peak, or whatever you want to capture! To figure out the azimuth of the sunrise/sunset, you can use The Photographer’s Ephemeris. Since that golden light only occurs at sunrise or sunset, you’ll find yourself hiking in the dark very often. Bring a flashlight for safety, so you don’t end up tripping on something! Headlamps work great too. There’s been numerous times where I’ve forgotten a good flashlight and had to hike back in the dark, carefully. One time I just used my cell phone as a flashlight (you might want to checkout that brilliant iPhone flashlight app). Of course we should not forget the most obvious…. a camera and beyond that charged batteries, but as far as true accessories go I don’t leave home with out a cable release. I would second the vote for a cable release. Also, a shoe-mount bubble level. Nothing is more annoying to me than a tilted image. I use mine on almost every shot. Thanks for the tips, Steve. I’m getting a tripod soon. Looks like my next purchase will be a polarizing filter, then a neutral density filter. By the way, the manual with my Nikon D60 says the D60 cannot be used with a linear polarizing filter, and to use a circular polarizing filter instead. Can you share some insights on this? Plastic bags and duct tape! Great list. I don’t bother with a cable release as I prefer to use the self timer with live view. Live view also allows me to use the grid lines to straighten the horizon, so I don’t use a bubble level either. I totally agree with everything else on your list, and I might have added a set of Graduated ND Filters as well. @Rana – Is that for protection from the rain I’m guessing? Good addition! @Sean – Good idea about the grid lines on live preview. I wish my XTi had that.. I’m tired of slightly tilted landscape photos! I’d like to avoid getting the bubble level, if possible. I have been buying from B&H for years too. They are great. I have been buying the B&W filters for several years also. I just bought my first neutral density filters a few months ago and have not been out to test them yet. I am a Canon owner also, 50D with dreams of getting a full sensor camera some day. I do like the 1.6 factor though, I have learned to work around it pretty well. I do mostly telephoto shooting, even short distance as in the 17-55 EFS, just got that one last week, before that I used my 17-85 and 28-135.
my 1.8 stop graduated neutral density filter is indispensable here in Yosemite; light tends to bounce off these granite walls, making it difficult to maintain details in shadowed areas–if you’re metering for the bright area above it! Here’s a little trick I’ve learned from my best friend: If you’re shooting at a slightly slower shutter speed, carefully jiggle the gnd up and down for a much smoother transition between the dark and light sections. Linear polarizers were used before autofocus cameras and are still used on medium and large format cameras as they have no autofocus, with a few exceptions for medium format. Circular polarizers must be used with autofocus cameras because a linear polarizer would interfere with both autofocus and manual focus, metering, and white balance. Remember that light is a wave emitted in all directions. Linear polarizers only let the horizontal or vertical component of light enter the camera. Circular polarizers let in both the horizontal and vertical components of light. Don’t restrict yourself to using a polarizer only on sunny days or before the sun goes down. For example, consider shooting a fall foliage scene in the Smoky Mountains with a stream and bolders in very low light. Even though the sun can’t be seen, there are image-killing reflections coming from the sky, especially on overcast days. If you rotate the polarizer with no change, take it off as every filter, no matter how expensive, is going to rob some sharpness from the image. Be sure to use a very thin polarizer with wide angle lenses and consider using a “warming polarizer” on overcast days. Even though digital can be post-processed and it is generally required, make the best image possible when you shoot. Don’t sound like the person who just fell of the turnip truck (I live in the South) by saying something stupid like “the image is just a building block and I will fix it in Photoshop.” If you don’t have the necessary understanding of exposure, composition, “seeing,” etc. you will just have a piece of crap “building block” that will probably look even worse after hours of Photoshop work. Shoot smart and process little. Mine saved my life when a bluff I was standing on collapsed dropping me 25′. Make you a small bean bag. Cut any kind of cloth you like into 9 x 6. Sew all sides and leave a small opening and fill it almost full with some small dried beans you can get at the store. You can set it on a rock or anything else when you just can’t get your tripod in the right place. It has worked well for me for many years. HI.. GUYS.. I’VE NIKON D50 AND A 18-55 f3.5-5.6 LENS NOW WHICH POLARIZER WILL BE GOOD FOR ME TO TAKE A LANDSCAPE PHOTOGRAPHY.. CAN YOU PEOPLE HELP ME PLS. HI.. GUYS.. I’VE NIKON D50 AND A 18-55 f3.5-5.6 LENS NOW WHICH POLARIZER WILL BE GOOD FOR ME TO TAKE A LANDSCAPE PHOTOGRAPHY.. CAN YOU PEOPLE HELP ME PLS. I AM WAITING FOR YOU RESPONSE..
Can’t disagree with any of these. And thank you for not specifying “Grad ND filter”. Those ruin more photos than they improve. I also use a cable release, but that’s just a personal preference. Many photographers get along just fine using the delay timer. All great tips, especially those in preparation for the unknown. Don’t forget a utility/multipurpose knife (like a Leatherman), a small notepad and pencil for taking (and leaving) notes, head protection (Gilligan’s hat, watch cap), and large leaf bag for keeping yourself dry, JIC. Great article. I also agree with Jim. I carry enough spare batteries to run my main body, flashlight and hotshoe flash. I agree with Sean and Eddie that (high quality) ND grads are helpful at times. I would like to add though, that all filters should be used sparingly. ND filters can cause color cast, mild blur, chromatic abberations (in contrast areas), can enhance glare and at times throw off your AF sensor. So I rarely use them in bright direct light. CP filters can cause much of the same in addition to mild distortion and can create unnatural dark gradients and low spots in skies. So I especially use CP filters very rarely and carefully when absolutely necessary to shoot in conditions that have reflective glare issues with glass or water. I don’t use them for skies very often, unless I’m shooting in hard haze or not in optimal time of day. Bottom line, if you are shooting in optimal light/conditions for you’re subject, you should rarely need filters. Other items I carry on wilderness shoots are remote shutter release, rain fly, cleaning cloth, small tool kit to tighten tripod legs, a ton of CF cards, small first aid kit, right lenses for the shoot, 1 back-up body, water and sugary snacks. ** Also flashlights Yes! Totally agree – MUST HAVE. I carry a camping tent-light – with a swivel head, adjustable orange/white light, it’s magnetic and flat on the bottom. Great for light-painting just after sunset, hiking in/out of a rocky canyon in the dark or clipping to your bag to find something . I have a velcro spot attached to my cable release and the other one on my tripod. Very handy to keep it from blowing around in the breeze. Also, velcro straps around my tripod legs to secure the camera strap in a breeze. Simple yet very helpful. Steve, back to your original #1, Tripod, don’t forget to turn off your “IS” or “VC” on your lense when using your tripod, if so equipped. Some cameras I’m told, have a focusing issue. Keep em coming Steve, you’re doing fine for those of us that need reminding. One important thing is missing from the list and that’s the cable/remote release. To use the self timer leaves much up to chance and the delay could be the difference between nailing the shot or losing it. And with a compass on the list, I would say a map would also be in order then. I keep a Snake Bite Kit in my camera bag. Nice article and very good comments. I bought a fishing vest that I use for a photograhers vest. I feel like Frank Burns from M*A*S*H, but without the lures hanging from my hat. Now I have the convience of having so much at my fingertips, leaving more room in my pack. Oh, depending on the terrain, if you get close up to objects in the foreground, and shoot from a low vantage, knee pads as well as elbow pads are worth considering. I always tell my wife where I will be and when to send the Marines if I am late! I never leave home without Deep Woods Off. I also take my Samsung Galaxy 3 loaded with a Compass, Level, The Night Sky, Google SkyMap, Weather Underground, Inclinometer, and TPE – to name a few fun and useful apps.